Wn Tre07, Le Tréport, Mont Huon, Stp. Gruppe Le Tréport, K.V.A. 'E1', Houte-Normandie. Wn Tre07, Le Tréport, Mont Huon. R630 casemate for a machine gun. Early wooden and earth bunker. The north side of the D940. 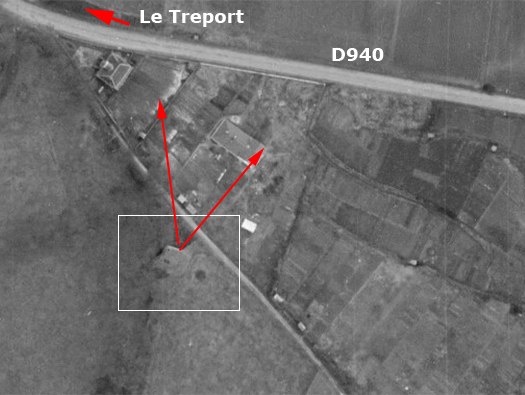 Tre07 with its R630 for a machine gun flanking the plateaux and the D960. R630 with a metal plate covering the embrasure. A 1950's photo showing the bunker and I am sure its still there in some form? MONT HUON MILITARY CEMETERY, LE TREPORT. Commonwealth War Graves Commission cemetery at Mont Houn where the dead from the base hospital were buried. 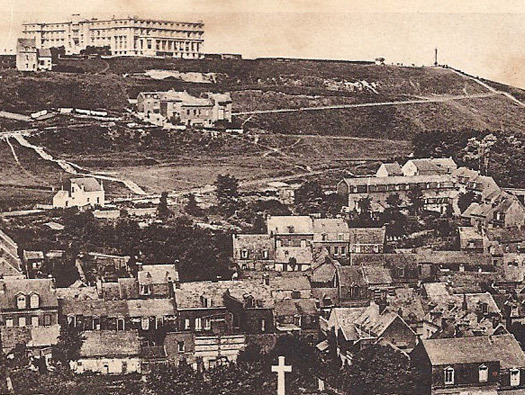 The original military cemetery at Le Treport filled, it became necessary to use the new site at Mont Huon. There are now 2,128 Commonwealth burials of the First World War in the cemetery and seven from the Second World War. 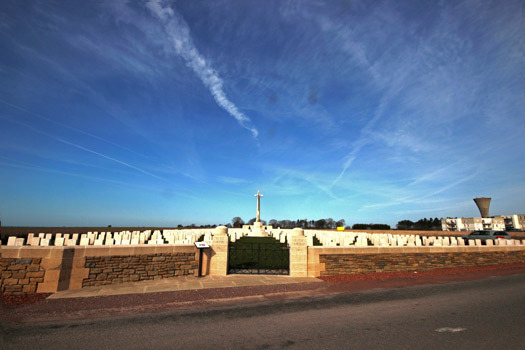 The cemetery also contains more than 200 German war graves and was designed by Sir Reginald Blomfield. Most of the original stones were hand cut but now they are all being replaced with a new stone and cut by laser cutter. 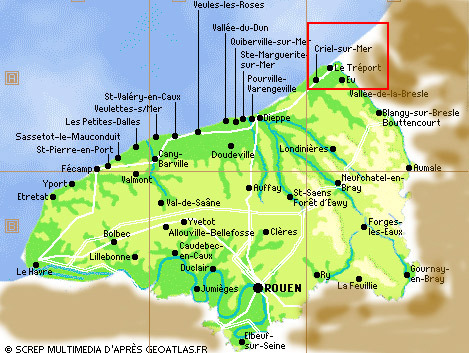 In 1880 a company conceived the idea of a housing estate on the plain of MONT-HUON and named it DOMAINE DU TRÉPORT-TERRASSES . A huge, magnificent hôtel called le Trinion was built and completed in 1913 (Henry SAUVAGE et Charles SARAZIN, the architects and conceivers of la Samaritaine department-stores in PARIS). A luxury hÃ´tel with 300 bedrooms was to attract the clientele belonging to the rich middle-class and compete with the sea-side resort of Paris-plage. A golf-course and a big garden were laid out but the expected crowds didn't come Consequently the housing-estate wasn't built and WW1 ruined this big plan. It was transformed into a British military hospital during the Grande Guerre and sheltered the soldiers wounded in WW1. After the war. they had to give up their plans and the abandoned estate was used as a camping-site and then became working-class gardens. In 1942, the German army blew it up, pretending it was a landmark to help the allied air-force. The only vestige left is the perron, leading up steps to the first terrace. Patients at General Hospital No.3 1914, No.16 1915, No.47 1917. 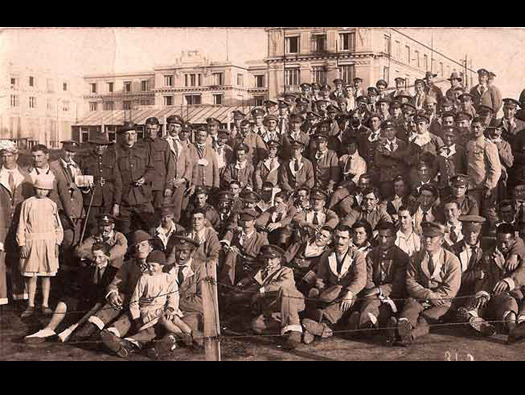 Look into the photo at the soldiers and also a few children. There is a complete mix of uniforms, hats and they have come from all over the Empire. Plan of the base hospital with red the Hotel.